If you've got kids in school, you shall be distributing a mass number of valentine's cards this week. This will be my little girl's second year doing valentines at school. Last year we learnt something: Little Smootch, she is a freak. It's true. Out of 2o children, mine was the only one who gave handmade valentines. Every other card featured a licensed character. Let me tell you how naive I was. I actually thought that handmade valentines were a given. The whole sloppy heart with paper dollie lace, some ribbons and sparkles made with love is so intergrated with v-day in my mind that I hardly entertained the notion that people actually buy those boxes of heavy paper printed with cartoon characters I see in the shops. Apparently, my daughter is a freak because I am a freak. But why, why, would anyone miss the opportunity for their children to engage in a little creative project? Creativity is so very good for the brain, and there are oodles of ways for the littliest ones to develop their fine motor skills. The best of all is that all an adult has to do is provide some paper, odds and ends from around the house like ribbons, bits of lace, or what have you from the craft stockpile (we all have them), and let the kids go. It's just so easy! Tomorrow I will be sending my daughter off with this year's crop of handmade valentines. Over the past week Smootch has been learning about stencils, how to make and trace them. She did all the cutting of scrap booking paper we received for Christmas. She poured white glue into a little container, and applied the glue with a toothpick. All sorts of valuable fine motor skill development. Smootch also did the creative design. My idea was that she was going to make a layered heart collage, but Smootch always has her own opinion. 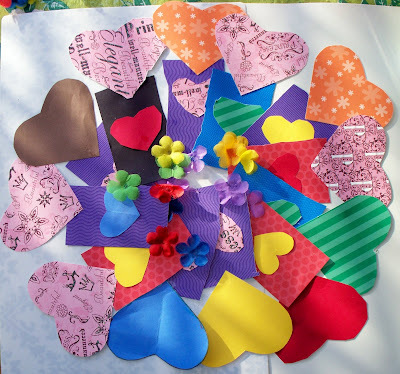 Each card is it's own body of love, with a heart 'crown', a main heart in the middle of the body, and then added some flowers from a broken dollar store lei Smootch received at a birthday party for feet. 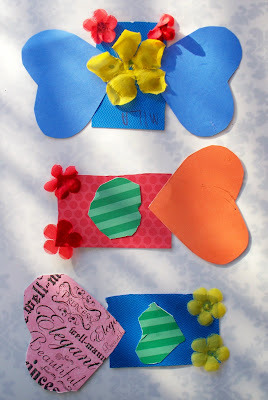 Smootch also made a special butterfly valentine for her teachers. While she was cutting and gluing the valentines, she also spoke about her teachers and classmates, which gave her a chance to articulate her feelings about them as individuals and also provided me with some insight about what happens to my girl when she goes to school. Now, here comes the tutorial. Ready? let them make valentines to give their classmates and loved ones. Good for you! Sometimes purchased is easier...but it's so much nicer when it's handmade! Honestly in all of my childhood years I don't remember receiving ANY handmade valentines. It's a little sad now that I think of it. Several years from now when I have my own children who will be distributing valentines, I hope I remember this post. 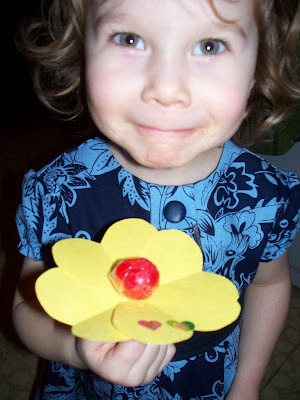 I remember being (I think) the only one with handmade valentines in elementary school. And I'm only 20.. My parents were definitely not the type to buy valentines. Hee hee I am totally with you! My kids are really going to be freaks by the time they are born, and are old enough to give out valentines, cause youre darn tootin they will be handmade. Cardboard, pre-printed valentines, where is the fun in that!!!!! i too have handmade valentines embeded in my soul. sometimes you just have to be a freak. her valentines turned out adorably. She came up with such beautiful valentines! Beautiful valentines! Great post - thank you for choosing the less-trodden path and doing it so well. Tomorrow my daughter will be bringing homemade valentines to school. We started off making them together and then she decided I should finish them and she should make the ones for her teachers. All good. This is her first year (and mine!) and I was shaking/quaking in my shoes, hoping that her classmates will like them. Then I read your post and realized that it is less about what sort of response we get and more about the kind of outlook and exposure/experience she gains growing up in a home like ours. No offence meant for the folks who do the store-bought kind - they're happy with those and we're happy with the home-made, glue-heavy, assymetrical, alternative-spelling kind. Someday I hope she'll ask her kids, "Valentines? Wanna make some for your friends?" Homemade is a lost art - and we're going to keep working at it no matter what other folks say. Happy Valentine's Day to you and your family too! i agree with you, too! and my first grader will be a freak this year again, as well! i personally think they look so much better than the store bought ones. there is just so much more thought and care that goes into handmaking your valentines, and my daughter has so much fun making them! I salute you. One should never miss an opportunity to make crafts with kids. It's so good for them and for us on so many levels. It also teaches them to appreciate hand-made things. I know way too many people who have no appreciation for hand-made, and I think it's sad. Simple, sweet and colorful valentine cards are right choice for kids!! Right! But I'm probably preaching to the choir here, but, comeonnow, homemade is best made. My son has always wanted the purchased Valentine Cards...always! To keep peace in the house, we do buy the simple cardboard character cards. BUT...he also has to make something to go along with those cards. I recently posted a very similar post to my blog. I did the exact same thing last year and was almost tempted to grab a box of mass produced cards, but couldn't do it. I am glad to know I am not the only freak out there!!! how cute are they! what a great job she did. BTW: I have used your peasant top tutorial a few times and love the results. you can see them on my blog if you want to check them out. thanks for a wonderful tute! They are adorable!! WAAAAY better than store bought, if you ask me! I just want to THANK you for being a freak and helping your daughter to be one, too! When my daughter goes to school I plan on being a homemade Valentine card making freak-mama, too!! Long live crafting! All of my kids made their own valentines this year and they enjoyed it as much as I enjoyed watching them. I always love the "wow...you have way to much time on your hands" comments from all the character buying valentine (or any other holiday/activity) moms. I just remind them that "I know what is important..."
I am so fortunate that my kids really love being creative and they are proud of their creativity and not embarrassed to share or learn new ones. My eight year old son want's to learn how to knit - I LOVE IT!! Bunch of little freakers I am raising!! I think it is awesome that you do this! My kids love doing crafts, but sometimes...it's nice to let them have their way and buy a box of cruddy $2 Valentines. If I were to insist that they make their own, even if they didn't want to, would they be expressing their own creativity or mine? My sons gave handmade Valentines this year. They were excited to make thier own. They love to create. My oldest even decorated his Valentine box with fabric. I am have made tham crazy. I really love you blog. handmade valentines are the best! I made one for my boyfriend this year. His birthday is on the thirteenth, so I gave him one half of a heart for his birthday, and the second half for valentines day. And they fit together on a little stand. The final count: of the 19 valentines my daughter receieved, two were homemade. I was pleasantly surprised. oMG, I was the only one in my class to make homemade cards from Tay, let alone bring them besides the teacher!! granted it's a preschool class full of 18 month olds... I just thought other moms would bring them also! ;) oh well, here's to creative Mommies!!! Yea...handmade are definitely nice...and when DD was 1st grade we did that too. Its fun. I don't feel the least bit guilty about buying a box of storebought now. I just don't have time for the entire V-Day thing as we are usually planning a birthday party, and I'm baking crap - oops, I mean lovingly made cupcakes and cookies - for the class party. I will say though - I've always encouraged my child to make her teacher a special valentine and write her a note. As a parent..I feel bad cause all those valentines - even the handmade ones - get pitched in the trash by Saturday. I should note also that my daughter doesn't wait a whole day to trash her valentines. Soon after they come out of the bag she's got them cut up into little pieces and she's giving them out to me, her dad and brother again as more valentines. For her, the whole thing is about cutting stuff up and giving. Which is the spirit of what I'd like to maintain throughout her childhood. I LOVE this blog btw. I've just discovered it but I will definitely be back soon. i came from a big family and we always made a valentine box for the house- all month we'd add handmade valentines for each other and on valentine's day we'd crack it open to see all the doilies and glitter and lace and home made love. my kids go to a montessori school where hand made valentines is mandatory. in fact all exchanges are. i'm glad its a value that their schools supports! this year (stella's second year attending) she reapeated what she did last year and henry followed suit. we made heart shaped crayon cakes that stella pokes a hole into and then strings on a necklace. she is the kind of crafter who feels the need to always have a crayon on hand or around her neck. she will love smootch's heart collages when i show her later today!